If your cat is breathing heavily while resting, it can be a sign of several common problems from anxiety to airway disease. Understanding some of the reasons for labored breathing in cats can help you assess the severity of the situation. However, if your cat is having difficulty breathing, this is an emergency, and you should take your cat to your veterinarian right away. Is My Cat Breathing Heavily? A normal cat should always breathe with small movements of its chest. If your cat's sides are moving a large amount, this can indicate labored breathing. Unlike dogs, cats should generally never pant. You can also try to watch for any increased abdominal movements with your pet's breathing. If you cat is breathing normally, you shouldn't see any excessive movement in the abdomen, or any hitch to the breathing. For a few cats, you can see labored breathing with exercise or stress. If your cat is panting after running around outside on a hot day or playing with a favorite toy, this may be caused by normal exertion. Other cats will pant or breathe rapidly when they have to ride in the car. Sometimes cats will hold their mouths part way open when they breathe. This can be an indication that your cat is congested in his nose or sinuses. You may also hear your cat breathe more loudly than normal. Why Is My Cat Breathing Heavily? Your cat may be breathing heavily for several reasons. If you think that your cat may be breathing heavily it is important to have him evaluated by your veterinarian right away. One of the most common causes of heavy breathing in cats is pulmonary edema, a fluid build-up within the lungs. This is often caused by heart failure, but can also happen with electrocution, near-drowning, choking, cancer, or other systemic illnesses. Some cats become so congested that they are unable to breathe through their noses. When this happens, your cat may hold his mouth partway open to breathe. This is the only time that home care for heavy breathing in a cat is appropriate. You can use a cotton ball and warm water to clean any discharge off of your cat's nose. Place your cat in a humid environment such as a bathroom while running the hot water, or in front of a humidifier. If your cat is not eating, seems lethargic, or has excessive congestion, you will need to see a veterinarian for an accurate diagnosis and possible medication. While it is more rare than upper airway infections, some cats can have a physical obstruction of their airway that will cause heavy breathing. Some of the possible causes of this can include a nasopharyngeal polyp, a foreign body, or a tumor. For cats that have sustained trauma, heavy breathing is a serious symptom. Trauma can cause bleeding in the lungs, a punctured or collapsed lung, a hernia that places pressure on the lungs, or other internal bleeding. How Cat Breathing Problems Diagnosed? Your veterinarian may be able to diagnose some of these medical conditions on a basic physical exam. For others, a chest x-ray will be needed. If your cat has severe labored breathing, it may not even be safe for your veterinarian to take a chest x-ray right away. For cats with pleural effusion, it is important for your veterinarian to drain a sample of the fluid from the chest. This can sometimes help diagnose the problem, but can also make your cat feel better. 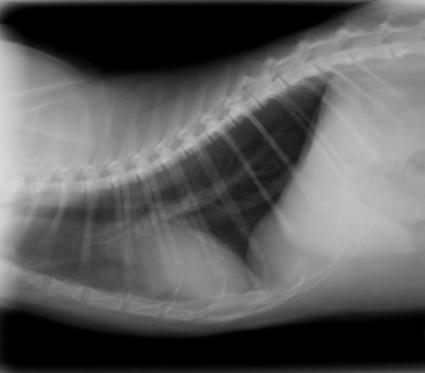 Feline asthma is often diagnosed on an x-ray, but in serious cases, referral to a specialist for bronchoscopy and special cultures may be needed. If your veterinarian suspects an airway obstruction or a nasopharyngeal polyp, your cat may need to be sedated for an oral exam, skull or neck x-rays, or an exam of the ears. What Treatment Is Available for My Cat's Labored Breathing? The exact treatment for labored breathing in cats will depend on the underlying cause. Often, some treatment will have to be started to ease the breathing before an exact diagnosis can be made. Pulmonary edema is treated with oxygen and a diuretic medication such as furosemide (Lasix). Pleural effusion is usually drained to help re-inflate the lungs. Cats with asthma may need to take a steroid medication or learn to tolerate a special cat inhaler. If your cat has an upper respiratory tract infection, he may only need some antibiotics and nursing care for a short period. Unfortunately, if your cat is diagnosed with cancer or FIP, the treatment options may be limited and are aimed more at keeping your cat comfortable. Remember that if you think that your cat has labored breathing this is an emergency. It is always safest to have your pet evaluated at the first sign of heavy breathing. With close attention to your feline friend, you can find him the help he needs and keep him at your side for years to come.